UPDATED (9/14/2016) Pre-orders are now available through GameStop. 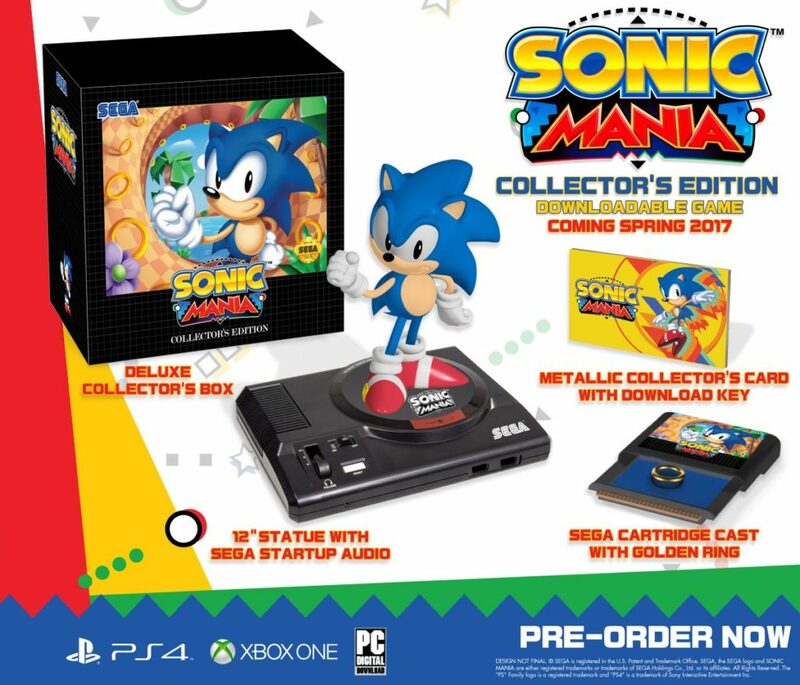 SEGA continues enticing us with the release of Sonic Mania by announcing a collector’s edition with a statue base of Sonic standing atop a Genesis (With an actual power switch that will yell SEGA!! at you,) a Genesis cartridge cast with a golden ring as well as the download code on a metal card. Priced at $69.99 these sets will release for all announced platforms for it’s spring 2017 release. While the Sonic social media accounts point to the official Sonic website for a pre-order page, at the time of this writing the website does not appear to be working and is instead directing everyone to Amazon to get their orders in. I’m a little surprised that the system isn’t replicating a SEGA Saturn, but let’s face it, with the game’s history being reflected on the Genesis (Without a SEGA CD or 32X mushroom head attachment, mind) it’s more than appropriate. Of course for some of you reading this, you may be wondering about a European release, and according to several sources it has been confirmed that there is no plan to do so. Strange, especially after the collector’s set for Sonic Generations was Europe only, it’s an odd move on their part. Nintendo fans are potentially equally bitter as not even the game itself is coming to any of their platforms. It’s unsure when these sets will sell out, but there is still plenty of time before it’s release in Spring of 2017.